I haven’t done a tutorial or dress diary post in so long! I used to love writing these, but between my job and photographing a lot of events, I just haven’t had the time. 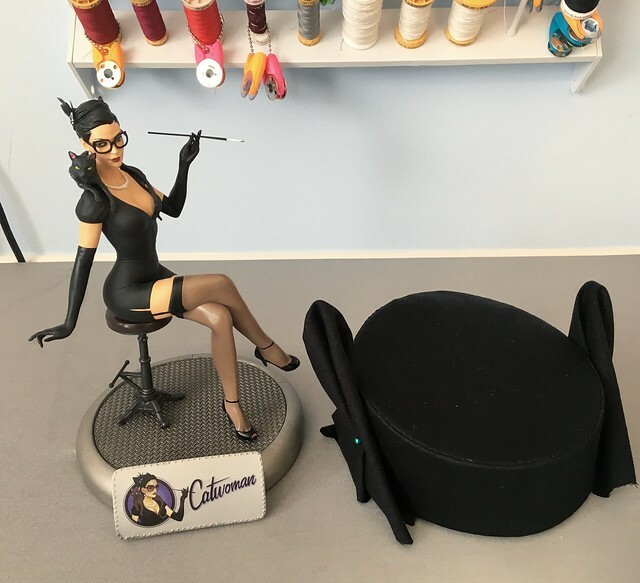 However, I have been trying to take progress photos regardless, and I just uploaded a bunch from my DC Bombshells Catwoman build last winter. 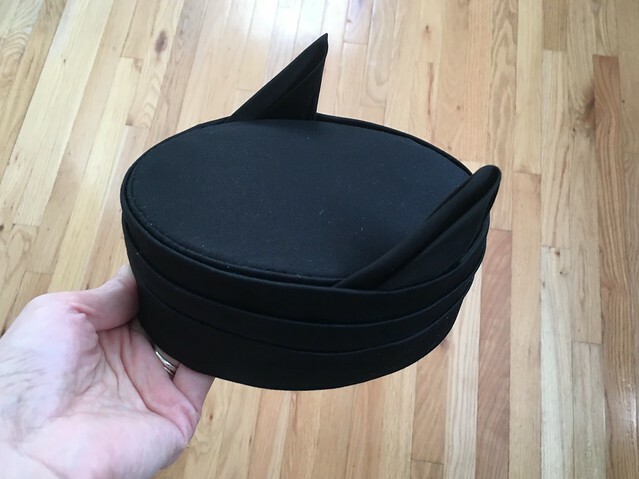 I’m really pleased with how that costume came out, so I wanted to share how I made it. My primary references were these two images. The first is an illustration by Ant Lucia, who did most of the designs for the DC Bombshells. The second is a photo of the statue that was produced based on Lucia’s art. I also own one of these statues, so I could take a look at it in three dimensions. I also looked at the sketches that can be found in the book, The Art of DC Comics Bombshells. Based on these references, I broke down the costume into its component pieces: the dress, the hat, the gloves, the jewelry, the shoes/stockings/garters, and the props. 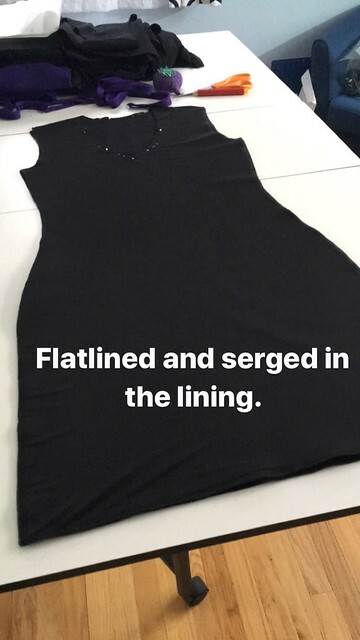 The biggest part of the costume is the dress. 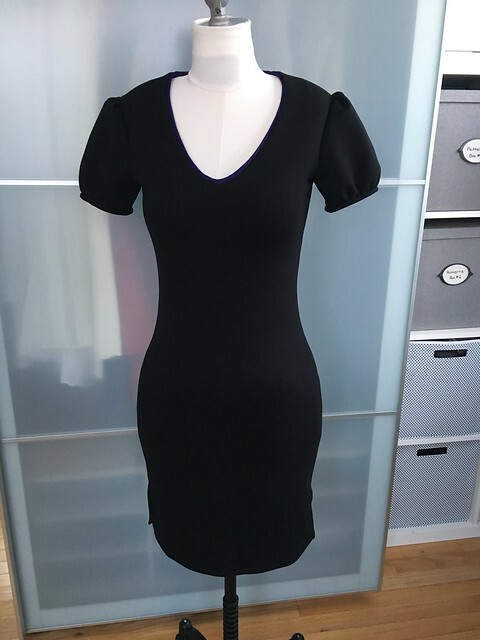 It’s a pretty simple sheath dress with puffed sleeves. 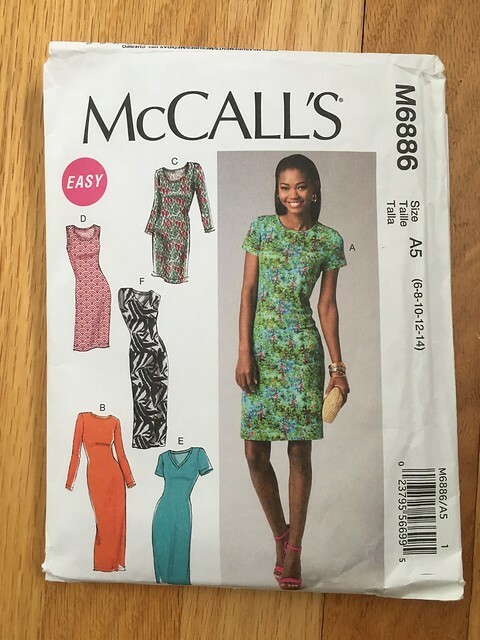 I used as a base the same pattern I used for my Stephanie Brown Robin dress, McCall’s M6886. It’s a great pattern, with different length, neckline, and sleeve variations. Here’s my mockup. 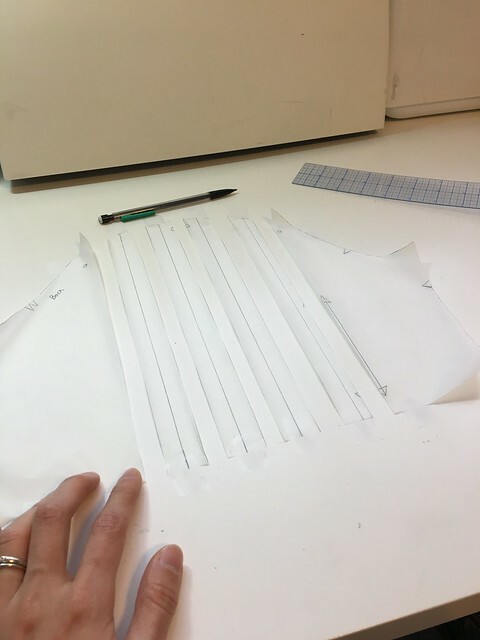 I only tested the body pattern pieces, as I knew I had to draft new sleeves later. Other than being a little too long, the pattern was ready to go. 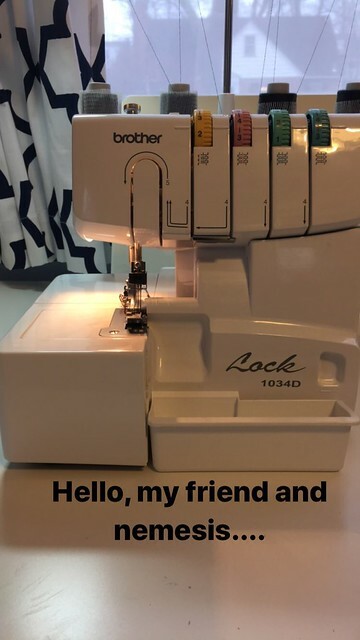 Time to break out that serger! 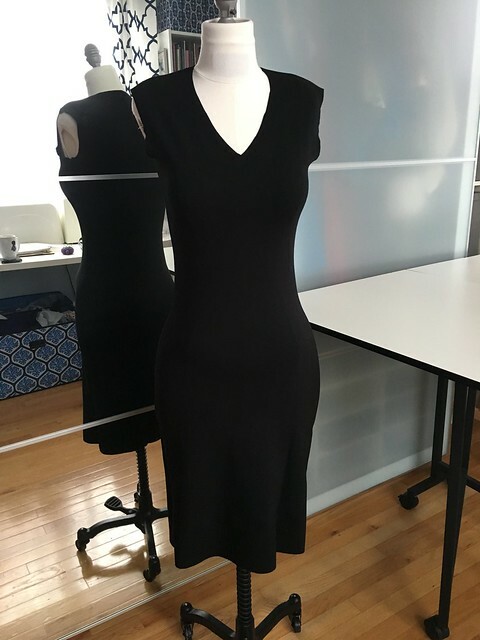 For my fashion fabric, I used a medium weight black spandex double knit, which had a lot of stretch and recovery. 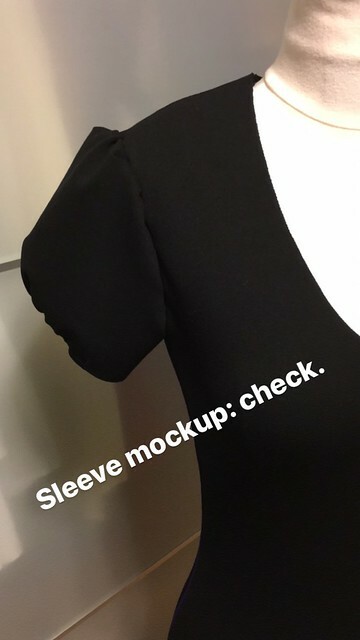 I lined the body with black swimsuit lining fabric. 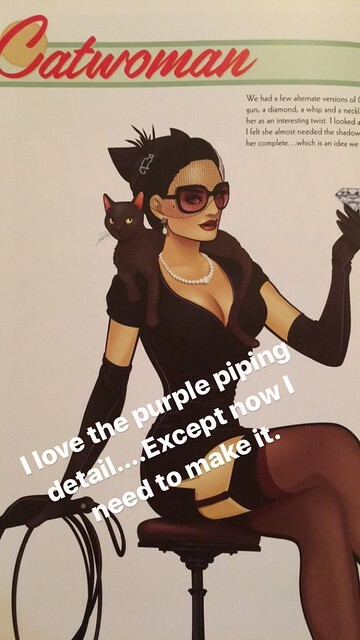 Ant Lucia added some really cool purple piping details to the side seams and neckline of Catwoman’s dress. They are not on the statue, but I knew I wanted them for my costume. Then it was on to sleeves. I took the short sleeve pattern from M6886 and slashed and spread it to make it poofy at both the top and bottom. 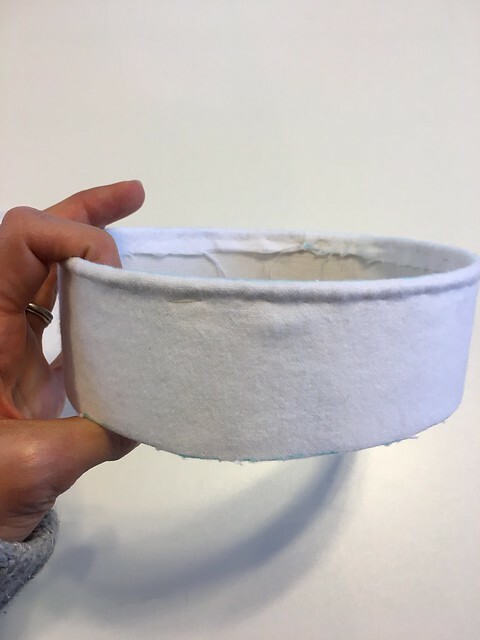 I started with the pillbox hat pattern in the book Period Reproduction Buckram Hats: The Costumer’s Guide by Crystal Herman. It worked with very little adjustment. 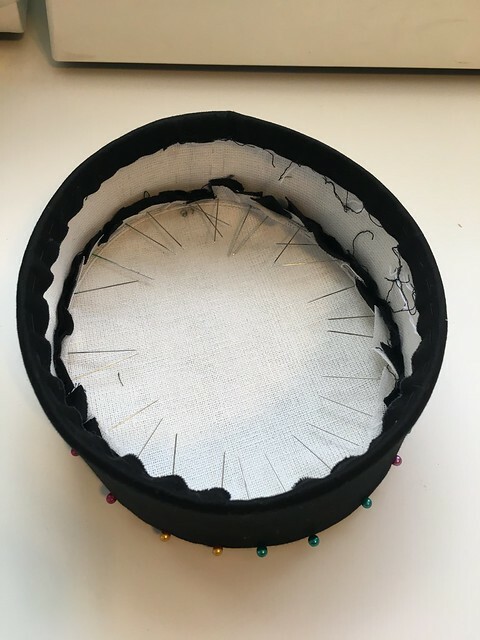 After cutting out the pieces in buckram (I used two layers for each piece, stuck together with fusible webbing strips), I reinforced them with millinery wire and covered them with cotton flannel. Then I covered the pieces in black cotton sateen and sewed everything together. 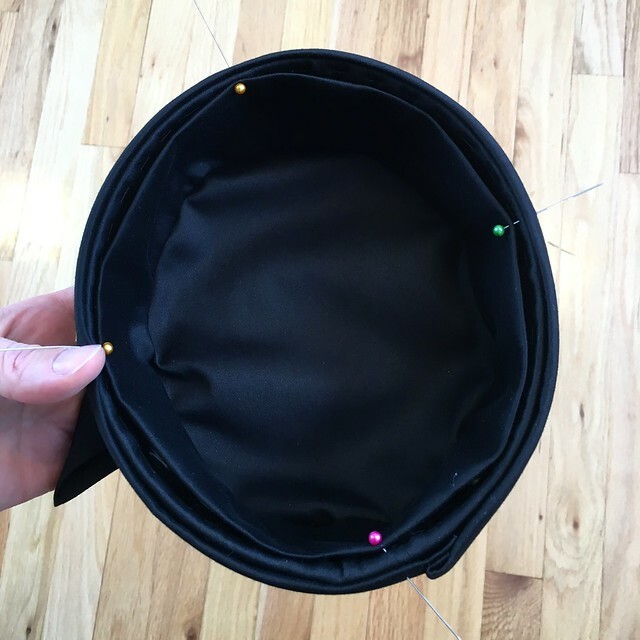 This is the part of making a hat where I usually stab myself five million times with pins. 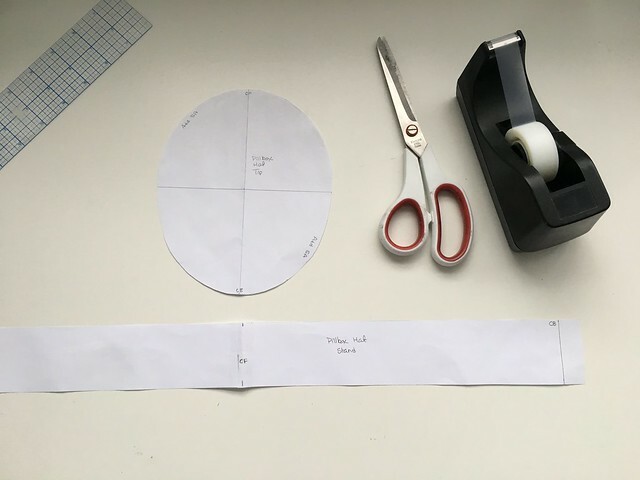 Testing out the pattern for the ears. 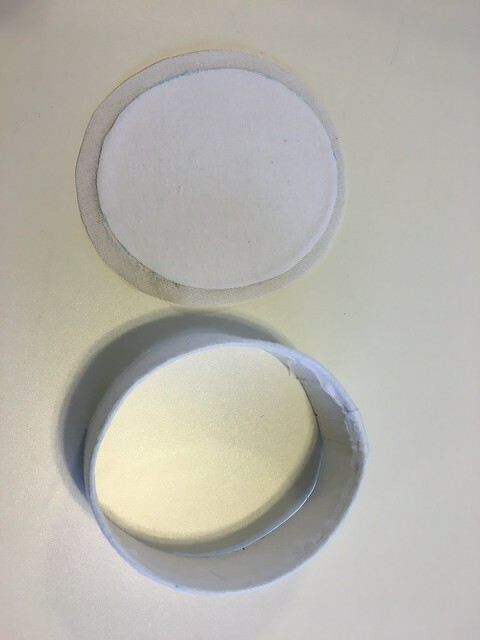 These were just folded pieces of cotton sateen. I didn’t stiffen them with anything. 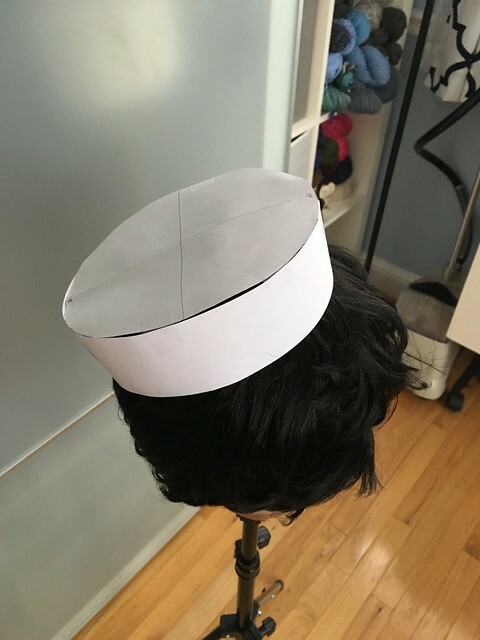 I sewed down the ears, then covered the outside of the hat with a pleated strip of cotton sateen. Then it was time to add a lining. Done! The brooch is a lucky vintage find. 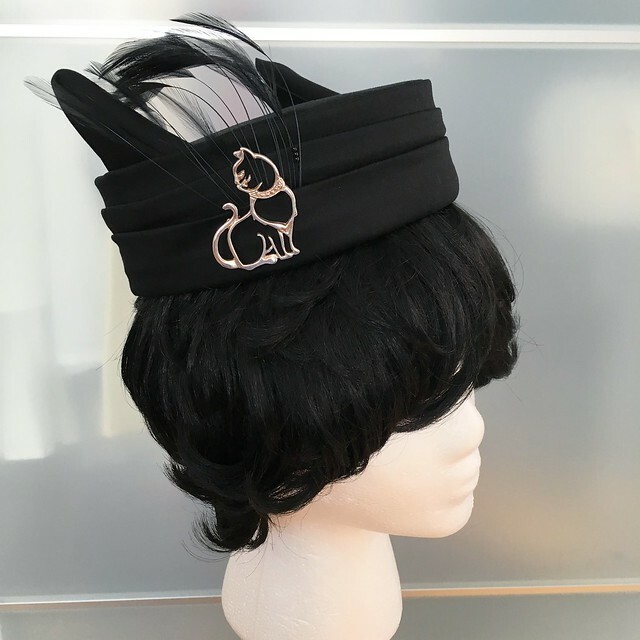 The feathers are just tucked into one of the pleats on the outside of the hat, then held in place by the brooch. That way, I can remove the feathers to pack the hat in a suitcase. I skipped the veil, as I thought that would be annoying to wrangle. 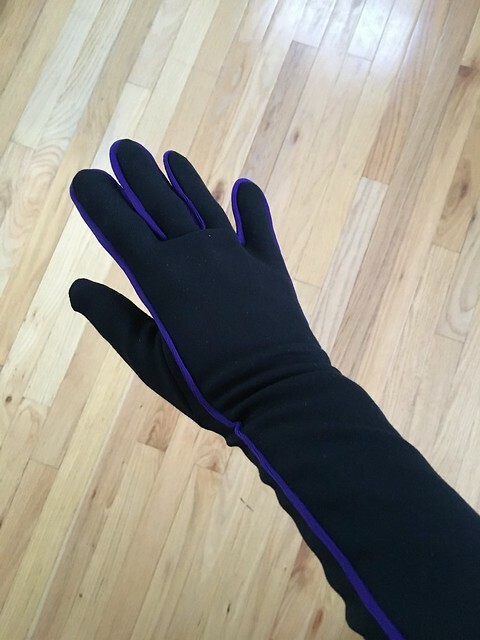 Just like the dress, Ant Lucia also added purple trim to Catwoman’s gloves. I dutifully decided I needed to do the same, even though I was running out of time to finish everything by Awesome Con. I pulled out my favorite glove pattern, McCall’s M7397. However, that pattern does not have a separate thumb, which is counter to Lucia’s art. Furthermore, I was afraid that having piping around the thumb would be really bulky. So I needed to change the pattern to put a separate thumb piece in. 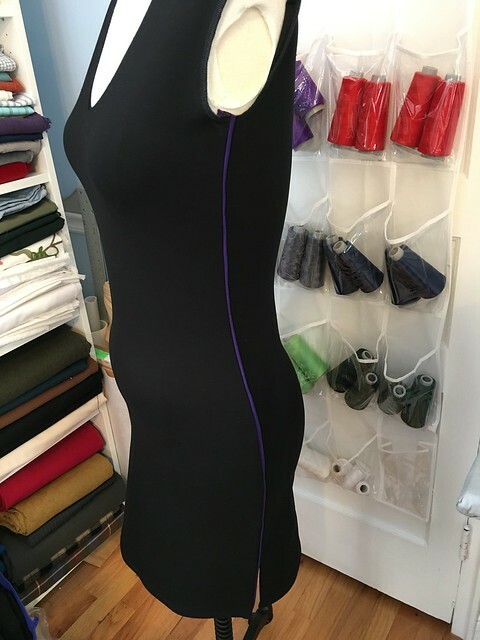 I used the same fashion fabric as for the dress, and the same scrap purple moleskin for the piping. Sewing these was pretty fiddly. I did it by hand, because I was sure I would mess it up by machine. I had to baste down the piping first, then sew everything together. 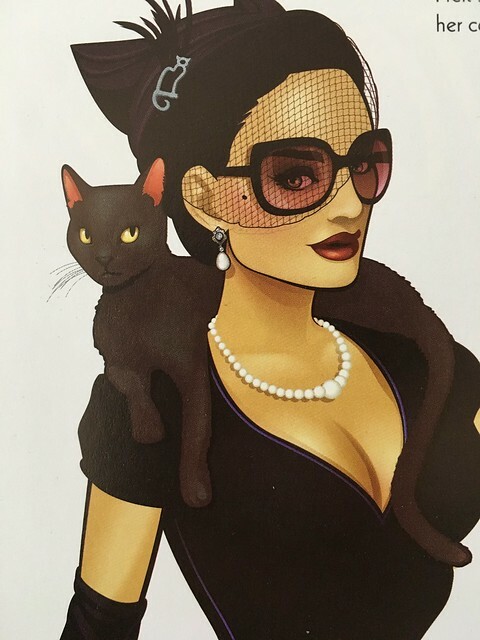 The Ant Lucia illustration has a pretty pair of earrings, a pearl necklace, and black glasses. 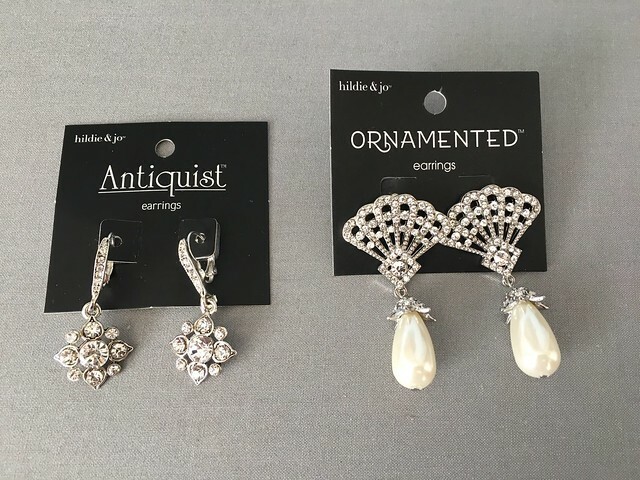 For the earrings, I started with these two pairs of costume earrings. I took the dangles off the ones on the left, turned them upside down, and attached ear clips to them. (I don’t have pierced ears.) 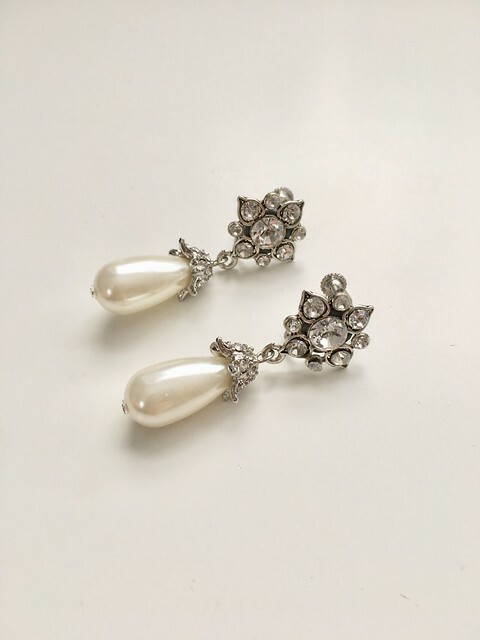 Then I took the pearl dangles from the ones on the right and attached them to the first pair. 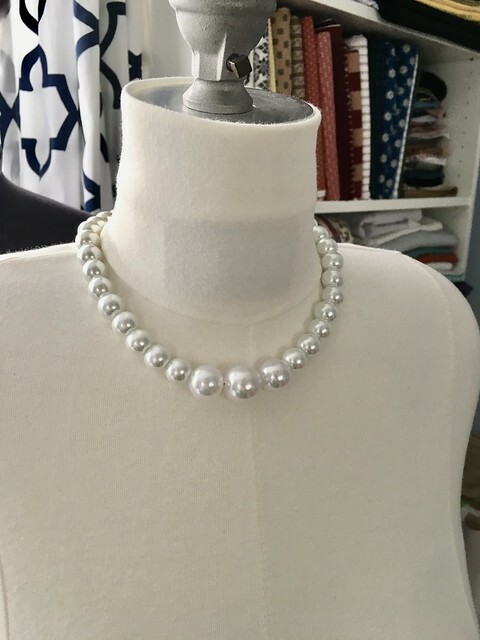 The only trick to the pearl necklace was finding pearls in enough different sizes. I ended up using 16mm, 14mm, and 12mm pearls. 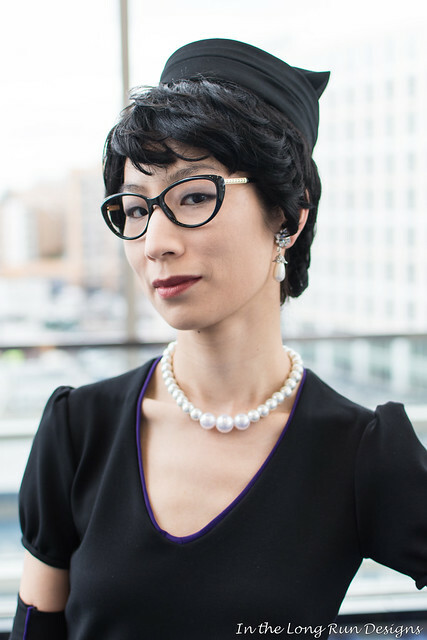 For the glasses, I bought these cat-eye frames from Amazon. I popped out the lenses so they wouldn’t create reflections in photos. I opted not to use sunglasses, as those would be annoying to wear inside. 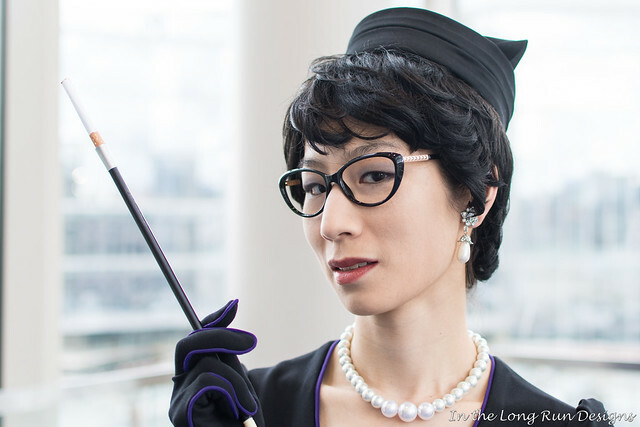 I purchased a pair of black seamed stockings (be careful, they get runs very easily! ), black shoes, and a garter belt from Amazon. I bought a simple black Halloween prop cigarette holder and some fake cigarettes, also from Amazon. The cigarette holder had some silver writing on it, which I was able to get rid of with a swipe of acetone nail polish remover. 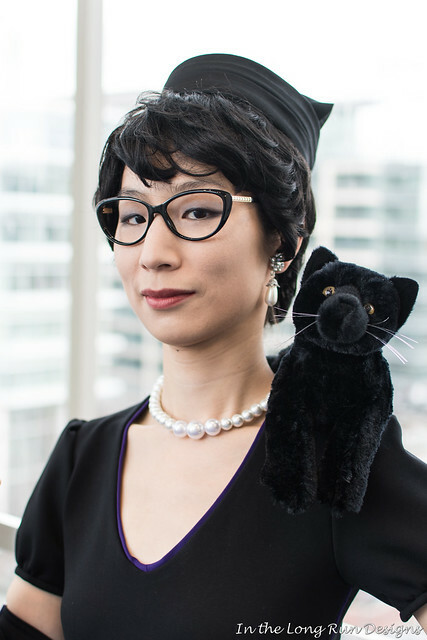 I also got a stuffed animal cat for photos. The whiskers were a little bent when it arrived, but I was able to straighten them with a hair dryer.